Here, we will look at the common causes, symptoms, treatment options and recovery process for Housemaids Knee. 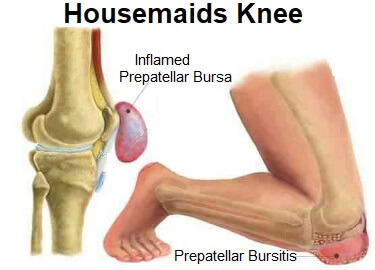 Housemaids Knee is the most common form of knee bursitis. Bursa are small fluid filled sacs found all over the body. Their job is to prevent friction between bone and soft tissues (muscles, tendons, skin and ligaments). When there is a lot of stress on a bursa, they fill with fluid. This is known as bursitis. 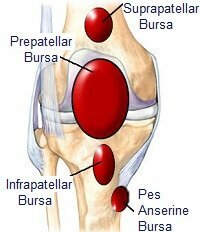 The prepatellar bursa sits at the front of the knee between the kneecap and the overlying skin. When the prepatellar bursa gets irritated from friction or pressure, it produces extra fluid to protect the knee joint and this swelling is known as prepatellar bursitis, or more commonly, Housemaids Knee. 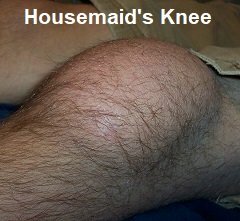 The most common cause of Housemaids knee is repetitive kneeling which causes friction and puts pressure on the bursa and kneecap. The bursa gradually gets inflamed and swells, becoming painful and putting pressure on the surrounding structures. 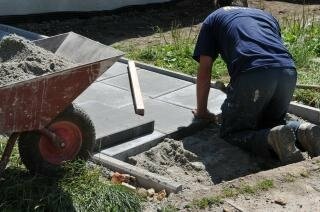 Nowadays Housemaids Knee tends to affect tradesmen and gardeners more than housemaids, thanks to the hoover! Prepatellar bursitis can also be caused by a direct blown or fall onto the front of the knee. Occasionally it is caused by an infection. You are at increased risk of developing bursitis of the knee if you have an underlying inflammatory condition such as rheumatoid arthritis. The most common symptom of prepatellar bursitis is swelling at the front of the knee, a bit like a small squashy orange. It may cause pain and redness over the front of the knee and make it difficult to bend the leg, kneel down or walk. Usually the doctor will be able to diagnose prepatellar bursitis it just by looking at your leg - it doesn’t require an x-ray or MRI. If the likely cause is an infection, the doctor will remove some of the fluid and have it tested, and you may then be given antibiotic. Prepatellar bursitis is often aggravated by tight muscles in the leg, so stretching these muscles out relieves the pressure on the bursa so it stops producing excess fluid. If you do have to kneel, wearing gel knee pads can make all the difference with bursitis. They take the pressure off the bursa and are excellent for eliminating pain and irritation when you do have to kneel. Visit the gel knee pad section to find out more. Generally, bursitis settles within a few weeks, if treated correctly. If you have already had it, it is advisable to avoid kneeling on hard surfaces by using some sort of cushioning such as gel pads to prevent recurrence. Not Sounding Quite Like Your Pain? Another common place to get bursitis is at the back of the knee, where there is inflammation of the popliteal bursa. You can find out more in the Bakers Cyst section. There are a number of other causes of front knee pain other than Housemaids Knee. If you want some help working out what is causing your pain, visit the Diagnose Your Pain section.